Under normal circumstances I’m calm and umm… perhaps disconnected (not sure it’s the right word, but that’s not remotely important). ANYWAYS, oh my foodness gracious I can’ t wait to share this salad with you. And for you meat-and-potato guys out there, yeah you, I’m feeling pretty solid on this one. I mean, filled with crispy roasted purple potatoes, caramelized eggplant, toasted almonds, plump sultana raisins, surely something in that list must have hit your sweet spot. Or maybe you’re wondering if you’d like that combination. But hey, practically everything in life is trial and error (don’t do drugs, kids). Yes, of course a homogeneous bunch of people will get along, but that’s probably the most they’ll ever be. As for me, I feel blessed to have someone sweet to lift my heart, someone spicy to tickle my mind, and someone to act as salt – whom I can’t live without. Life is a potato salad; you can put whatever you want in it. It can be a side, it can be a show. It can ruin you, it can make you. I take chances with my potato salad. I take time with each component I’ve chosen. I don’t start with a recipe – so it won’t ever be wrong. It’s just that you want it to fulfill its purpose of providing joy and nourishment to those you love, and not have it end up in the trash. To roast the eggplant and zucchini, preheat the oven to 450 degrees F, with one rack placed at the lower third of the oven and the other at the upper third. Toss all ingredients together very well, spread in a single layer onto a clean baking sheet. Bake in the preheated oven on the top rack for 15 minutes, or until the edges are brown and the centers are tender. Let it rest for 5 minutes before lifting them from the pan. The 5 minutes of rest will allow steam to permeate beneath the vegetables so they don’t stick and you can get them out of the pan with their beautiful caramelized bottoms intact effortlessly. To make the roasted potatoes, combine the water and vinegar in a pot, cover, and bring to the boil. Add 1 tsp of the salt and the potatoes. Cover and boil for 5-8 minutes, or just until tender. Drain and rinse under cool water only until cool enough to handle, then cut each half in half again, to get quarters. Observe the skin, and once it loses its sheen from the moisture, toss the potatoes with the remaining salt, pepper, and oil. Place the potatoes, skin side down, on a baking sheet (you don’t need to line it or anything – this way you can get the spuds super-crispy). Bake in the hot oven (450 degrees) for 15~20 minutes, until they whistle and puff (literally) and get, of course, super-crispy. To assemble the salad, whisk together the mustard and balsamic vinegar in a small bowl. 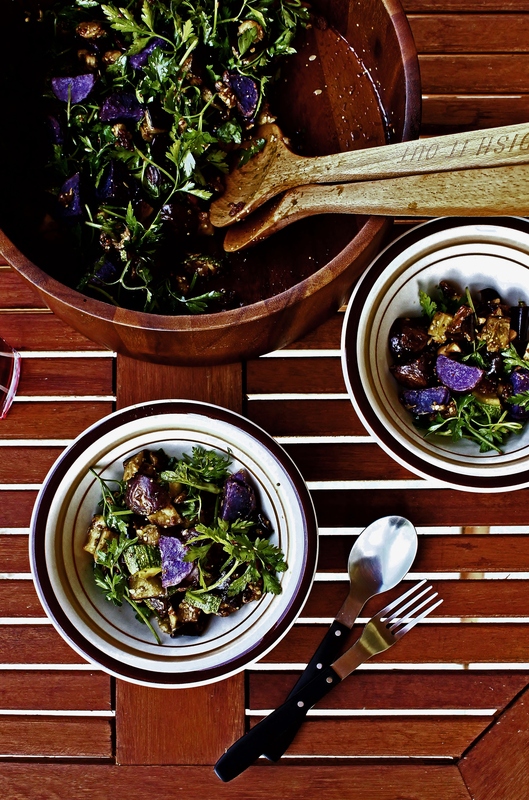 Toss together the roasted eggplant, zucchini, potatoes, parsley, almonds and raisins in a large salad bowl. Pour the vinaigrette over and toss to combine. Serve with a fresh baguette or a steak for a rounded meal, or just have it all by itself, which is the way I have mine.